I feel like I've been waiting ages to show you this quilt. 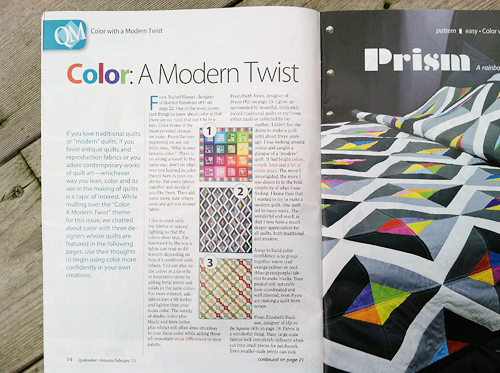 Last July, Quiltmaker magazine asked me to create a quilt pattern for their January/February 2012 issue that fit into the category of "modern color". 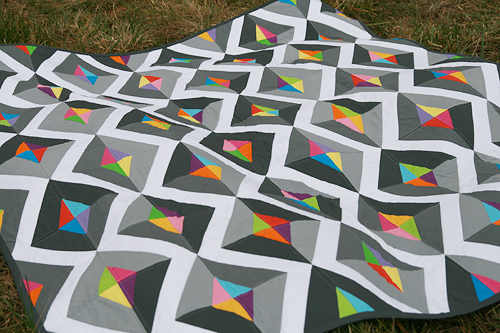 I designed this quilt, which I call Prism. It uses 99 paper pieced blocks. Simple paper piecing though, I promise! I spent August working on the quilt, and that even included taking it and my machine on vacation with me so I could get it done on a tight timeline! Luckily I have a very understanding husband. 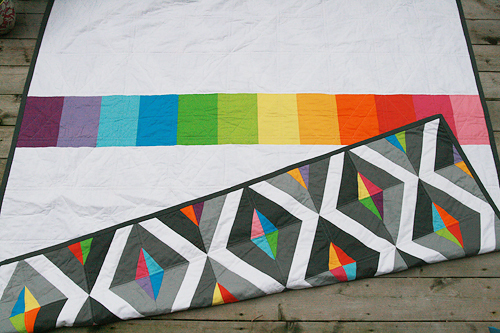 The quilt is made using all Free Spirit designer solids. 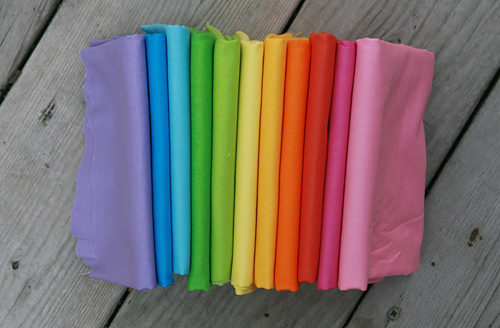 These are all the bright colors, except for the dark purple. So the magazine article itself is really cool. I'm lucky enough to be featured with two other bloggers I'm sure you know - Rachel from Stitched in Color and Elizabeth from Don't Call Me Betsy. They both also have great patterns in the issue. We were all interviewed on our thoughts regarding use of color and there is a write up before the patterns. My two pages in all their glory! The final quilt measures 70" x 85". I quilted it in straight lines, on both sizes of the horizontal and vertical seams. I also quilted in the ditch on both sides of the white fabric. The back is solid white with a simple stripe of all the colors I used on the front. 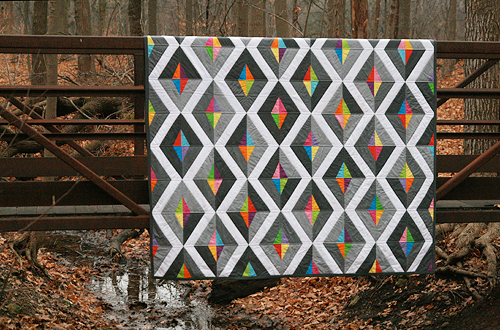 The solids and the pattern of this quilt make it probably the most modern I've created. I'm pretty happy with how it turned out and am really thrilled to be in my first print magazine. I hope you will check it out! 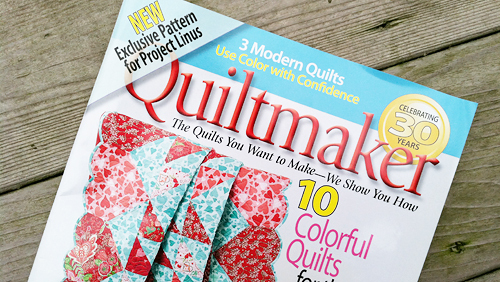 And speaking of pattern making, Generation Q has a post up on their blog about what *really* goes into writing a pattern. 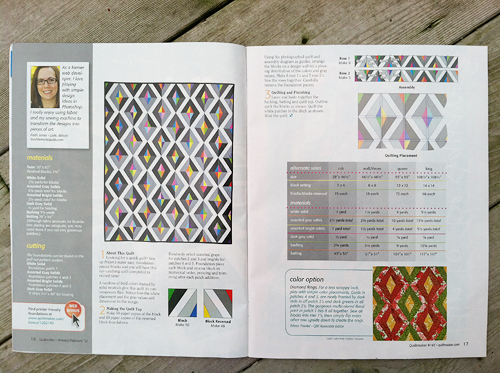 If you are interested in pattern making yourself, or just are curious into the time and effort involved, head on over.